There are certain Tarot cards whose imagery immediately conjure up negative emotions, and the Five of Cups carries such weight. This is a card which signifies loss as well as the painful challenges which stem from that particular loss. 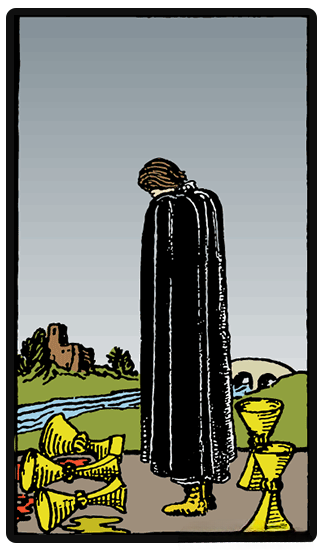 The card depicts a figure that is wearing a black cloak. The person hides his face in what seems to be despair. There are five cups on the ground, three of which have fallen while the other two remain standing. The person, however, seem to notice that there are two standing cups as is too busy mourning over those which are fallen. There is a powerful river which flows between him and a house or a castle in the distance, indicating that a torrent of emotions have separated him from home. The Five of Cups symbolizes disappointment, and the feelings that come when things go differently as you expected. You are feeling unhappy that a certain situation hasn t really turned out the way you have hoped it would. Instead of moving towards a more positive perspective, this card seems to say that you are dwelling in the past, inducing feelings of self-pity and regret. The water which is actually spilled from the cups shows that you might have missed an opportunity. It also shows that the problem is mostly emotional and not material or financial. Instead of moving towards a more positive perspective, this card seems to say that you are dwelling in the past, inducing feelings of self-pity and regret. The meaning of the Five of Cups shows that you may have certain issues letting go of things which are in the past. What is more, it also shows that you are unwilling to learn from mistakes that you have already committed. The card is often going to reflect a person who is so caught up in his past that he is absolutely incapable of moving on. This means that he has a high chance of missing out on what new joys that the future can bring.